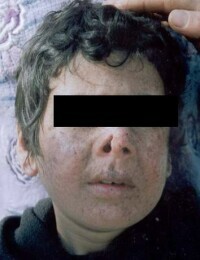 Xeroderma pigmentosum is a rare skin disease. It is due to a genetic defect. DNA repair enzymes are mutated and can no longer repair the DNA changes caused by UV rays. The result is malignant forms of skin cancer (e.g. melanomas) which cause the death of most of the children affected during their first decade of their lives. Xeroderma pigmentosum is a very rare disease; with regional differences incidence is between 1:40,000 (Japan) and 1,250,000 (USA); in the USA there are around 250 people with documented XP, in Germany approximately 50, most of them are children. There are almost no therapy options. Patients are advised to avoid any form of exposure to the sun. NASA has developed special suits for those affected which are intended to protect patients from the dangerous sunlight. Patient S.S. was diagnosed with xeroderma pigmentosum at the age of 10 months. Despite the greatest possible avoidance of sunlight at the age of 8 a squamous carcinoma of the nose developed as well as multiple melanomas in the face and body area. Three cycles of chemotherapy (Cyclophosphamide, Vincristine and Vinblastine) unfortunately brought no success and tumour size was not reduced. On the contrary, the skin tumours increased in size. The child's parents decided upon therapy with Ukrain. The result was a complete regression of the tumours (see photos). The situation with xeroderma lesions improved over the whole body. In October 2003 Dr. Nowicky wrote letters to the chairman of the Bundesfachgruppe Dermatologie (Federal Specialist Group for Dermatology), the board of the Arbeitsgruppe Melanom und Dermatologische Onkologie (Work Group for Melanoma and Dermatological Oncology) of the Österreichische Gesellschaft für Dermatologie und Venerologie (Austrian Society for Dermatology and Venereology) and the president of the ÖGDV Wiener Medizinische Akademie für Ärztliche Fortbildung und Forschung (Vienna Academy of Postgraduate Medical Education and Research) in which he pointed out to the noted doctors the successful treatment of xeroderma pigmentosum with Ukrain. In the letters Dr. Nowicky also asked them to "pass on the information to patients or their family members". In their joint reply the professors pointed out that "the Österreichische Gesellschaft für Dermatologie und Venerologie keeps no register of these extremely rare patients" and that "a recommendation for Ukrain ... is not possible for this indication". Why, despite repeated requests, does the government of Austria not arrange for a clinical study to be carried out to test the efficacy of this medicament with xeroderma pigmentosum? 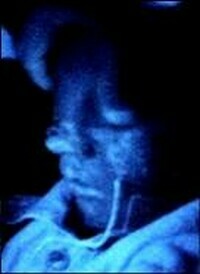 Patient S.S., an eight year old boy, was presented with an ulcering lesion of the nose. As he was 10 month old, xeroderma pigmentosum was diagnosed. (Patients with xeroderma pigmentosum have a severe sensitivity to all sources of ultraviolet radiation, especially sunlight and develop serious sunburns with onset of poikilodermia in the light-exposed skin. There is a wide range of symptoms: blindness and deafness, blistering or freckling on minimal sun exposure, developmental disabilities, dwarfism and hypergonadism, increased skin and eye cancers, and mental retardation. Squamous cell carcinomas, basal cell carcinomas and malignant melanomas already appear in childhood. The majority of patients die before reaching adulthood because of metastases of malignant melanoma).Until the age of three years the number of skin lesions increased considerably. In May 2002 skin cancer (squamous cell carcinoma) at the nose was diagnosed, T4NXM0, histologically verified. From May till June 2002 three cycles of chemotherapy were administered (cyclophosphamide, vincristine, vinblastine). The therapy failed and the tumors grew up. Clinical investigation in April 2004 revealed deforming malignant melanoma of the nose with invasion into the cartilage of nasal septum, measuring 3x3 cm. On 20 May 2004 the therapy with Ukrain was started, 5 mg intravenously twice a week, up to a total dose of 85 mg. One month after the last administration of Ukrain a complete regression of the tumor was revealed. The skin defect was partially replaced with connective tissue. Xeroderma skin lesions improved throughout the body. Patient S.S. before the therapy with Ukrain. Deforming invasive malignant melanoma of the nose. April 2004. Autofluorescence of NSC-631570 at the melanoma area under UV-light during the first intravenous injection. May 2004. Patient S.S. in December 2004. Complete regression of the tumor, with connective tissue substitution.